A startup company co-founded by former Apple CEO John Sculley has formed a partnership with his former company, as Apple's stores will now carry Misfit's Shine wearable activity measuring device. Founded on the day Steve Jobs died, Misfit bills itself as a tribute to both the Apple co-founder and the "Think Different" ads his company produced. The company's first product, the Shine wearable computing device, was originally funded with the help of an Indiegogo campaign that raised more than $845,000. The quarter-sized Shine is billed as "the world's most elegant physical activity tracker." The $100 device includes a three-axis accelerometer, and it fits into a number of specialized clasps, such as a sport band, a necklace, or a leather band that sits the device on the wrist like a watch. It pairs with an iPhone app, which tracks the activity the device registers and allows users to see their own progress and set goals. Shine also tells time, tracks sleep, and performs other actions. The device's minimalist frame is crafted from aerospace-grade aluminum, with 1,560 laser-drilled holes aimed at making the device waterproof but still allowing light to get through. 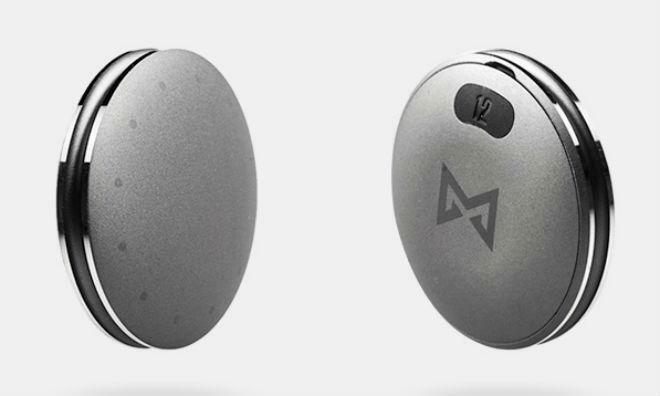 According to Misfit's page, the CR2032 battery in the device will get four months on a single charge. Apple stores in the United States, Canada, Japan, and Hong Kong will now carry the device. Stores in Europe and Australia will be carrying the device beginning in September. Misfit co-founder John Sculley is widely regarded as the driving force behind Steve Jobs' removal from Apple decades ago. Sculley says he never fired Jobs, but he has admitted that it was a big mistake that he was ever brought on to helm the tech giant. Under Sculley, Apple's sales grew from $800 million to $8 billion, but he also saw criticism for forcing out Jobs, as well as the transition of the Mac to the PowerPC platform. Shine's appearance in the Apple store will mark yet another step in what would appear to be an inexorable move among manufacturers toward wearable computing. Industry observers believe manufacturers will ship five million smart watches in the year 2014, up considerably from the 500,000 expected to ship this year. Those units will likely include offerings from Sony, Misfit, and fellow startup Pebble. Also crowding the field, though, will likely be Apple, which has been making stepstoward pushing out an iOS-compatible watch device. Apple will likely find itself competing against Google, Microsoft, LG, Samsung, and others as the wearable technology arena heats up.